Susana Torres Prieto is PhD. 'Doctor Europeus' in Slavic Philology by Cambridge University and Universidad Complutense. She did her postdoctoral studies on history in Paris (EPHE) and on paleograhpy and codicology in the US (Ohio State University). Professor Torres has developed her academic and research career in the areas of Slavic and Medieval Studies. She has specialized on the literature and culture of Russia from the Middle Ages until now, as well as on the means and context of transmission of knowledge, on which she has published extensively. She has taught in several universities in Spain and the US and, after having been member of several international research groups, directed her own international research group on translations into Slavic of Greek religious texts. She has been appointed Visiting Scholar at the Universities of Harvard, Ohio State, and Cambridge (UK). She is also member of several scientific societies worldwide. Her current research focuses on the transmission and representation of ideologies of power from the Middle Ages until now, particularly in the different Classical and Biblical models used in Eastern and Western Europe. 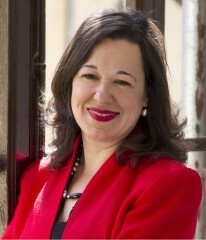 Susana is currently Professor of Humanities and Academic Director of Humanities at IE University and IE Business School. She is also Researcher in the Cátedra La Caixa/IE of Management.